September is more than just that wonderful song by Earth, Wind and Fire, it's a time to make a switch to support your community! One of the easiest ways to do this is by examining your banking. In today's world, the biggest banks are holding the most money, but not lending nearly as much as the local banks and credit unions. Here in Arizona, there are only a handful of local banks and credit unions, but as the Institute for Local Self-Reliance's banking study shows, it's the local financial institutions making the biggest impact in communities. 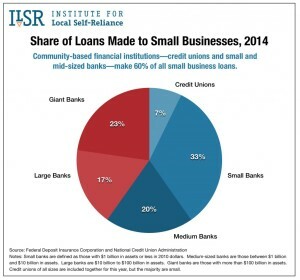 Despite only holding 24% of all assets nationwide, local financial institutions make up 60% of all lending to small and local businesses. You may be asking yourself, "Why is that?" Well, thinking through who is in charge of local institutions, we find that the teller all the way up to the president lives in our state and understands the needs of that community. They want to see progress just as much as we do, but just like any bank, we can't get that progress unless we put our money in too. For our September evening mixer, members were introduced to Gateway Bank in Mesa. This local bank has received recognition for its return to the old-fashioned way of banking, where the staff knew everyone by name and treated you like a person instead of a number. James Christensen, President of Gateway Bank, addressed members about Gateway's progress and convenience for local businesses and individuals and also invited his favorite local food truck, Super Farm Super Truck to come out and serve up delicious carne asada, veggie and chicken tacos as well as incredible homemade ice cream!